The Progress & Freedom Foundation Blog: Against "Autonomous Driving"
Now donâ€™t get me wrong, Iâ€™m no Luddite. Matter of fact, Iâ€™m obsessed with technology and A/V gadgets, and I have covered tech policy issues for a living a 3 different think tanks over the past 16 years. I love all things tech. But I love driving more. A lot more. I have been fanatical about my sports cars ever since I was a kid. From my first car--a 1979 "Smokey & the Bandit" Pontiac TransAm--to my 86 Mustang GT, to my 90 Nissan 300ZX Twin Turbo, my BMWs (two M3s and an 850i) all the way to my current 2005 Lotus Elise--I have been completely obsessed with cars and the joys of motoring throughout my life. And the idea that weâ€™ll all one day soon be driving to work in the equivalent of personal subway cars makes me a little sad because it means the joy of driving might me lost in coming generations. I wonder if my son will grow up with the same passion for motoring that I have, and that my dad had before me. (Iâ€™m certainly going to have something to say about it!) And I wonder if, a generation from now, â€œdriverâ€™s educationâ€ classes will consist of little more than downloading a user name and password for your computer-car. On the upside, I suppose I could see the advantage of making the driving experience fully automated for all those idiots on the road who really do engage in risky behaviors in their cars, like â€œe-mail, eat[ing] breakfast, do[ing] your makeup, and watch[ing] a video while commuting to work,â€ as Wagoner suggests. I hate those SOBs. They give me nightmares because, at a minimum, I fear what they might do to my car when they are not looking at the road. Worse yet, I think of the danger they pose to pedestrians (like my kids). So, perhaps a Jetsons-mobile for these morons will be an effective way to reduce accidents and traffic fatalities. But as for myself, I will pass on â€œautonomous driving,â€ thank you very much. I want to be fully in control of my motoring experience forever more. 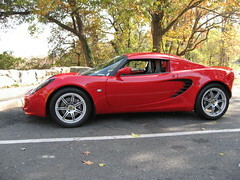 Especially behind the wheel of my beloved Lotus Elise!